Miss Beryl: Donald, does it ever bother you that you haven't done more with the life God gave you? Donald: Not often... now and then. There are only a handful of actors in the business that make their profession look so easy to such a point that it's hard to believe they're not merely playing an extension of themselves. Paul Newman is one of those individuals blessed with such a gift. Mention his name and some of the finest performances of the last century emerge in one's mind, in films including Hud, The Sting, The Hustler, Butch Cassidy and the Sundance Kid, and Cool Hand Luke. Additionally, I have to throw in some left field gems like Slap Shot, Blaze, and Harry and Son amongst those renowned classics, if only to underscore his versatility and knack for choosing great scripts. While sorting through their holdings for their most recent batch of DVD catalog releases, Paramount has unearthed one of Newman's best, the undervalued 1994 comedy-drama, Nobody's Fool. Highly praised at the time of its original release, and nominated for two Academy Awards® (one for the actor, the second for writer/director Robert Benton's witty screenplay), its lack of box-office returns and strike out at Hollywood's annual big dance pretty much relegated Fool to minor league status in most recent overviews of the actor's career. Such labeling doesn't do justice to this alternately warm and wickedly biting slice of blue collar America, adapted from Richard Russo's best selling novel. Newman stars as Donald "Sully" Sullivan, a charmingly irresponsible, set-in-his ways, yet immensely likeable resident of snow-covered North Bath, NY, whom the locals would probably hail as a favorite son if not for his penchant for getting into minor courtroom snafus with the owner of the Tip Top Construction Company, as well as his numerous traffic violations. Making do with a comfortable living arrangement as a boarder for his grade school teacher turned landlord, Miss Beryl (Jessica Tandy), and his on again/off again employment status with smart-alecky Tip Top bigwig, Carl Roebuck (Bruce Willis), life is somewhat good, yet one can see a twinge of regret behind those beer-fueled blue eyes. One day while walking off some pain in his bum knee, Sully has a fateful reunion with only son Peter (Dylan Walsh), whom he deserted not long after his first birthday. The younger Sullivan is undergoing a marital crisis of his own, yet unlike pops, Peter is attempting to tough it out, if only to provide a stable household for his two precocious sons, an environment he never experienced until mother Vera remarried. Oh, and did I mention its Thanksgiving at the time of all this reemergent activity? In between attempting to make amends with Peter and forge a promising relationship with his willing grandson, Will (Alexander Goodwin), Sully must thwart off a trio of meddling nemeses including Miss Beryl's overprotective elder son, Clive (Josef Sommer); hotshot police officer Raymer (Phillip Seymour Hoffman), who evidently studied at the Barney Fife School of Law Enforcement; and of course, Carl, who doubles not only as his surly boss, but a rival in an ongoing cat and mouse game involving a coveted snowblower. Yet, that may not be the biggest catch in their little tug of war, as Roebuck's fetching wife, Toby (Melanie Griffith), shares a mutual admiration with Donald, her favorite amongst Roebuck's staff, who stands out because, in her words, he's "worse off than me." It's not often that I grant a film the stamp of perfection, but Nobody's Fool is worthy of such a grade; everything works from Benton's patient storytelling, chock full of unforgettable dialogue; Howard Shore's gentle score; and a flawless cast right down to the most incidental of characters. Speaking of the latter, I positively adored the quirky nature of the townspeople surrounding Sully, falling somewhere in between the likes of Northern Exposure and Picket Fences; you have to love a community where a construction worker along with his one-legged lawyer do battle with a shady business owner by day, but put aside their differences when the sun goes down for a few rounds of poker. Following Newman's stellar lead are a never-been-better Griffith in a role that expands the potential she displayed in Working Girl, the perfectly cast Willis (then in the midst of perhaps his best quality streak as a performer, thanks to the bookend triumphs of Pulp Fiction and 12 Monkeys), and in what would be her final film, the phenomenal Jessica Tandy as Miss Beryl, Sully's former grade teacher who has more faith in her boarder than he displays in himself. Also scoring on the impression meter are Pruitt Taylor Vince as Donald's mentally-challenged best friend, Margo Martindale as the earthy barmaid of North Bath's most popular watering hole, a smoothly understated Dylan Walsh (currently staring on the surprise F/X hit, Nip/Tuck) as Sully's son, and the multi-talented Philip Seymour Hoffman in an early role, already displaying an incredible penchant for completely disappearing into a character as a by-the-book police officer. Image Transfer Review: Since Nobody's Fool fell into the same batch of Paramount's September 2003 releases that gave us the anomaly-plagued Regarding Henry, I worried that this film would suffer the same fate. Happily, that's nowhere near the case. Other than a few instances of minor edge enhancement, this transfer flows as smoothly as raindrops making their way down Sully's windshield and comes off as pretty as a lovingly decorated Christmas tree. Noted cinematographer John Bailey's warm, colorful visuals that capture the essence of a snow-covered town during the holiday season are lovingly replicated in a sharp, crisp, easy on the eyes transfer that scores on almost every technical category, from the rock solid black levels in night scenes to the perfectly balanced daylight exteriors, which must have been a challenge to tweak appropriately for DVD, given the iffy results of past films set in similar climates that attempted to make the digital leap in the format's early days (like Polygram's original issue of Fargo). Audio Transfer Review: Howard Shore's lovely score (in collaboration with the London Philharmonic and Metropolitan Orchestras) benefits the most from the disc's specially created 5.1 mix. With the rears serving the purpose of expanding the music and providing outlets for occasional ambience, the extremely well recorded dialogue is planted front and center with no harshness or shortcomings. The original Dolby Surround 2.0 mix heard in theaters is also included, but once you experience the full bodied richness of the brand spanking new Dolby Digital version, there's no turning back. Extras Review: At the risk of suddenly going picky during an otherwise can't-go-wrong overview, I can't believe that Paramount couldn't take the time or at least attempt to conjure up supplements for one of their finest films in recent memory. With so many great actors to talk about, the transition from book to film and the beautiful New York towns utilized in the shoot, a commentary track featuring director Benton and novelist Russo would have been a wonderful bonus. Instead, we get nothing; not even a trailer. But the low price point will offset your frustration (if not mine). As the movie poster's key tag line so rightfully states, "Worn to perfection." 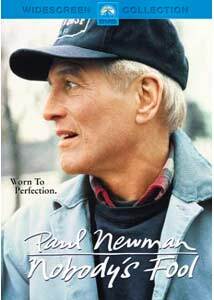 One of Paul Newman's finest performances, Nobody's Fool receives a just-shy of perfect transfer from Paramount. Though the lack of supplements is truly lamentable, the movie itself brims with excellence from every conceivable angle that, in the end, it's all you need.